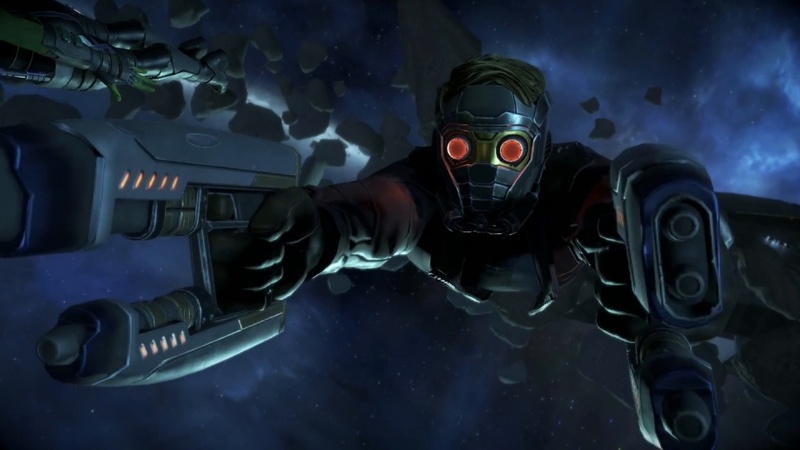 Telltale got to pick a license of Marvel's to adapt to their episodic formula and chose Guardians of the Galaxy. A perfect fit it would seem, but does the first episode deliver? 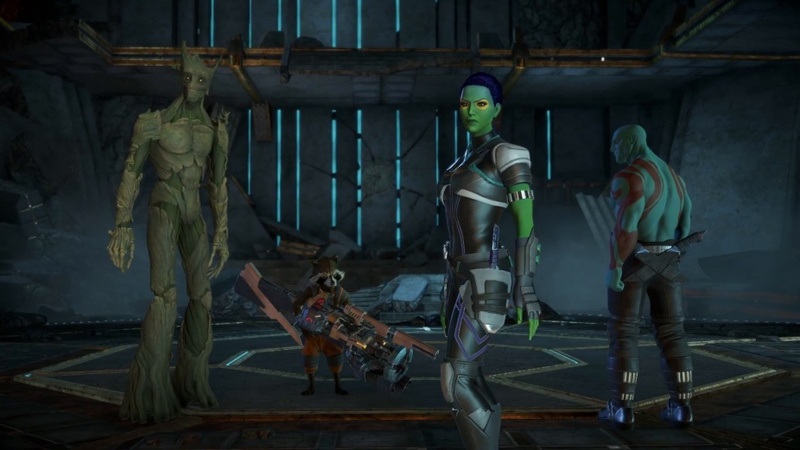 Guardians of the Galaxy is a wonderful property for a Telltale game in many ways. Multiple colourful characters, humour at every turn, excitement, a great soundtrack. Everything is there for a truly great episodic adventure, yet the first episode comes off feeling kind of flat. For all the talk of how different Telltale were treating the property, it really comes across as though they've just used the standard mould and poured Guardians of the Galaxy into it without much care or attention. That's not to say there aren't good things in this first episode, Tangled Up in Blue, but we just had to vent a little frustration and disappointment right off the bat. The game offers your typical mix of dialogue options and quick time events - tried and tested Telltale staples - but the first episode also offered one slightly larger area to explore and a scene where you walk around The Milano, talk to your crewmates, and also check some correspondence (where you'll find a couple of neat little pieces of fan service). As is the case in most Telltale games, the puzzle you'll need to solve in the open area isn't particularly elaborate, but you'll at least get to utilise some of Star-Lord's gadgets. The scene aboard The Milano also featured some highlights as far as getting to know the characters and learning about backstory, even if the dialogue came across a little stiff here. We're going to touch slightly into spoiler territory here to explain the premise of the story, as the game starts out with our heroes tracking Thanos to a Kree temple, or well, sort of, it's not exactly like they've got a plan or anything. In fact, very soon Thanos will be dead, and the heroes are left in a kind of vacuum and without purpose having killed the titan they banded together to defeat. What now? Turns out the artefact Thanos was after in the temple is at the core of the story. It presents Peter with a vision of his mother, and in typical Guardians of the Galaxy fashion, our heroes are then robbed of the artefact. It's an interesting setup, but it also left the first episode feeling a bit anticlimactic, and we're now hoping that all the setting up you do, including whether you choose to sell off Thanos' corpse to the Collector or do the right thing and hand it over to Nova Corps for the substantially smaller reward, will make for interesting twists down the line. We're also interested in how our choices will affect our relationships with our fellow Guardians. It's hard to tell just how far Telltale will allow you to push things, but that's one area that has us interested ahead of upcoming episodes. Presentation-wise Telltale has opted for something that lands in the middle of their usual stylised visuals and realism. It feels a bit disjointed with some characters more detailed and realistic than others. We feel that this license would have been better off with style more similar to Tales from the Borderlands. It delves unnecessarily into the Uncanny Valley. We were particularly bothered by the weird eyebrow movements, and it's safe to say it wouldn't have bothered us had the graphics not been this realistic. We played the game on PlayStation 4, and while it didn't struggle as much performance-wise as Batman, there were a couple of occasions where the frame-rate dropped. The license itself comes with a soundtrack that is brilliant, but naturally having to stretch it over five episodes of about two hours in length, Telltale can't be as snappy with it as in the movies. However, the music does a good job on the whole of conveying the particular Guardians atmosphere. Where the game fails to do this is generally in the dialogue; the delivery just isn't as good as it needs to be and certain dialogue options seem a little out of character for Star-Lord. There are gems in there, and we can't help but chuckle at Rocket and Groot at times, but overall it is a bit crude and not as on point as it needs to be. Perhaps it's just more apparent when compared to the movies than it would be otherwise. It's a surprisingly weak start to the series, but we're still somewhat intrigued to see where this is going and how our choices will influence the group dynamic. How far can we push Gamora? This series is not a lost cause yet, but Telltale needs to up their game in future episodes to do the property justice. A great cast of characters, Interesting story premise, Tried and tested Telltale formula, Some funny moments, Rocket and Groot. Somewhat anticlimactic first episode, Dialogue simply doesn't pop enough, Strange choice of art-style, One or two technical hiccups.